LABCO's annual Black Box showcase marks a decade. Photo courtesy of Gwen Hunter Ritchie. Incorporating visual artists and musicians into a dance production is nothing new. In the past few years, however, local dance groups like The Pillow Project and Bodiography Contemporary Ballet have been using such artists not only as collaborators in a show, but as colleagues presenting their own talents on the same program. Such is the case with LABCO Dance's 2008-09 season-opener, Black Box X, being held this weekend at Breathe Yoga Studio. The annual showcase of established and emerging local artists is a mix of dance, visual arts and live music. The program also marks the return to the stage of dancer/choreographer Sally Sherman, who gave birth 18 months ago. She will premiere her new solo "Arms of a Woman," inspired by, and set to, singer Amos Lee's haunting melody of the same name. Sherman says that the five-minute contemporary modern dance, performed with accompaniment by guitarist Jeff Johns, will "play off the work's title by focusing on the use of arm movements in the choreography." Dancer/choreographer Rachel Renock's five-minute modern dance solo (untitled at press time) is meant to experiment with the dynamics of movement. The recent Slippery Rock University graduate says she was interested in stepping out of her artistic comfort zone with the piece, which is set to the music of former Frou Frou singer Imogen Heap. "I am working with slower movements than I am used to," says Renock. "There is no theme for the solo; it's movement for movement's sake." 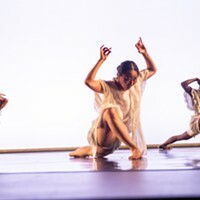 LABCO's contribution as a troupe to the program is an 11-minute excerpt from Slippery Rock faculty member Ursula Payne's work-in-progress, "Under Lock and Key." 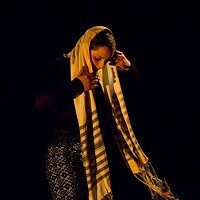 Payne says that the contemporary modern piece, set to an original score by Andy Hasenpflug, "deals with domestic violence and the realities of what happens to women in intimate partner relationships." The completed work will debut in LABCO's January performance at the New Hazlett Theater. Rounding out the offerings at Black Box X will be the "found object" paintings and sculptures of Danielle Brannigan, a performance by trumpeter James Moore, and Chrissy Nelson's solo dance work "Judgment Day."